Khaled A. Beydoun is a leading scholar on Islamophobia, national security and anti-terrorism law, and civil liberties. He serves as an Associate Professor of Law at the University of Detroit Mercy School of Law, and is Senior Affiliated Faculty at the University of California-Berkeley Islamophobia Research & Documentation Project. 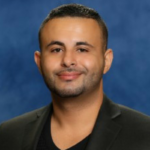 A Critical Race Theorist, Professor Beydoun’s research has been published in top law journals, and his book, American Islamophobia: The Roots and Rise of Fear, will be published by the Univ. of California Press in 2018. ​Complementing his academic work, Professor Beydoun is an active public intellectual and speaker. He has lectured at colleges and universities nationally and internationally, including Harvard, Yale, and Duke, and has been featured on top media outlets. He also practiced law for seven years before beginning his career in law teaching. Professor Beydoun currently serves on the U.S. Commission for Civil Rights, appointed to serve on the Michigan State Committee in 2017; is a member of the Association for American Law Schools Minority Executive Committee; and served as a Consultant for the African American Policy Forum. He is a native of Detroit.